Baby Bjorn and Ergo are two of the most popular brands of baby carriers. Both manufacturers offer a range of different baby carriers in different sizes and styles. There are some basic characteristics that make Baby Bjorn and Ergo carriers distinct. In addition to their baby carriers, both companies also offer various accessories for use with their carriers, and Baby Bjorn also produces a range of other baby care products. One of the most obvious differences between the Baby Bjorn and Ergo baby carriers is the position in which the baby is held. In the Ergo carrier, the baby is held against the parent, while in the Baby Bjorn they are sitting in a carrier that is strapped to the parent. The Ergo Carrier does not contain a frame, so the baby is cradled close to the parent, which can be particularly soothing for very young babies. It is even possible to nurse your baby while they are in the Ergo carrier. The Baby Bjorn is worn across the chest, while the Ergo can be worn either on the back or on the chest. Ergo baby carriers can be worn on the chest, like a Baby Bjorn carrier, but they also offer the option of carrying the baby on your back, like a rucksack. This can be a more comfortable option, particularly when the child is larger since it places much less of a strain on the back. Most people find it much more comfortable to carry their baby on their back rather than across their chest. However, some people prefer to have their baby in front of them, particularly when the baby is very young. The Ergo baby carrier can be used to carry your baby on your front, with the baby facing towards you. This can enable you to keep an eye on your child, and it also offers you the chance to interact with your baby. This can be particularly important when you are carrying a younger baby, who will be more interested in looking at you than in looking at the world around them or over your shoulder. The Baby Bjorn is always used to carry the baby on your chest, but unlike the Ergo, it also offers the possibility of carrying your baby with them facing outwards, so that they can look around them rather than at you. 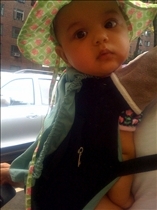 Many babies enjoy looking at their surroundings and this carrier gives them the best possible view. The Ergo baby carrier is capable of carrying larger and older babies that the Baby Bjorn carrier. This means that it can potentially be useful for longer since your baby will take longer to grow out of it. Some people who start off with a Baby Bjorn carrier decide to buy an Ergo baby carrier once their child is too big for the Baby Bjorn. The weight limit for the Baby Bjorn is 26 pounds. The weight limit for the Ergo carrier is 90 pounds. Both the Baby Bjorn and Ergo carriers are themselves light weight and easy to pack down for travel or storage, although the Ergo baby carrier tends to be able to roll up smaller than the Baby Bjorn. Although the Baby Bjorn carrier is designed to be as comfortable as possible, many people still find that it places an uncomfortable strain on their back, particularly when it is being used with a larger child. The Ergo baby carrier is generally considered to be more comfortable to wear. It comes with a hip belt that helps to take the strain off your back and it also offers the option of carrying your baby on your back rather than at the front, which can be much easier for your back, particularly with a larger child. Many parents also believe that the Ergo carrier is more comfortable for the baby since it holds them in a more natural sitting position. However, there are plenty of parents whose children love sitting in the baby Bjorn carrier, so this may be more of a difference in personality than in comfort. Baby Bjorn and Ergo carriers both offer stylish options for carrying your baby, but many people find that both they and their baby prefer one style over the other. Baby Bjorn carriers allow the baby to face outwards, giving them a better view, but Ergo carriers can be more comfortable for both parent and child, and they can be used to carry the baby on your back or one your front. Ergo carriers also enable closer contact between parent and child. Baby Bjorn carriers can hold babies up to 26 pounds. Baby Bjorn carriers are always positioned on the chest. 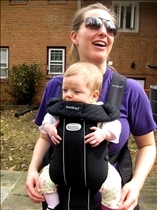 Ergo carriers can be worn on the chest or on the back. Ergo carriers tend to be better with larger, heavier babies. Ergo carriers can hold babies up to 90 pounds. Which baby carrier is easier to wear?